After all that, they hugged their sisters. After the marathon that was the months between that first scrimmage in October and this Division II national championship game. After the war that was their semifinal match up with then-undefeated Drury. 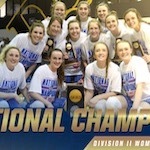 After the back-and-forth, grinding title-game with Southwestern Oklahoma State, a game the Bulldogs thought was theirs at one point before Maddi Chitsey (6'2''-F) tied the score with a 3 with three seconds left in the first overtime, a game that needed two overtimes before a champion could be crowned. After all that, Maddi hugged her sister Bobbi, Olivia Robertson (5'10''-G/F) hugged her sister Juliana, Caitlyn Cunyus (5'6''-G) hugged her sister Channing. Lubbock Christian Chaparral hugged Lubbock Christian Chaparral. LCU had just won its second-ever national title by defeating SWOSU, 95-85, in the first ever DII title game to go to double-overtime. Lubbock Chrisitan Coach Steve Gomez didn't think his Chaps were ready to win a national title when they lost to the Bulldogs, 77-75, back in December. He knew Southwestern Oklahoma State could. He told SWOSU coach Kelsi Musick and her Bulldogs as much after that game. But his team still had so much room to grow, and he's proud of how tough his team was battling through the adversity they endured to realize their potential and win it all. Gomez understands how much a bounce here, a bounce there, a 3 hitting, a 3 missing, can determine who is able to hoist a trophy and who has to suffer the pain of defeat. He gets how this game can drive people crazy. It's not lost on him how close Southwestern Oklahoma State was to winning its first national title. Lubbock Christian (32-5) trailed by seven points at halftime. It watched SWOSU miss a 3 with seconds left in regulation that would have won the game. It missed a game-tying 3 with eight seconds left in the first overtime period. But that missed 3 from Olivia Robertson, on a play Gomez stole from Boston Celtics coach Brad Stevens the Chaps had never run before, fell into the hands of LCU's Allie Schulte (5'10''-G). Schulte got the ball to Maddi Chitsey. Chitsey nailed a 3. And the Chaps out-scored the Bulldogs (35-2) by 10 in the second overtime. Musick knew her team would bounce back from its slow start in the first quarter because it's something SWOSU had been able to do all year. That's why she told them during the first media timeout, the Chaps up 10-0 with 5:50 left in the first quarter, to just settle down, relax and stick to the game plan. But that rebound Schulte grabbed, that 3 that Chitsey hit. 'It kind of took the air out of us and we just didn't regain our poise,' Musick said. The Bulldogs are grateful for how far their season went. They're grateful for the fans who supported them along the way and the many who traveled to Alumni Hall on Friday to watch them play the Chaps who made this championship game feel similar to a home game. The loss is just going to sting for a while. Bethany Franks, who scored 25 points for SWOSU, said it will fuel her during offseason workouts. Tucker finished with a game-high 30 points and 16 rebounds. Her double-double led the Bulldogs, who shot 33.3 percent from the field and 31.6 percent on 3s but also hit 17-of-19 free-throw attempts and scored 26 points off 18 LCU turnovers. Robertson led Lubbock Christian with 24 points. Chitsey recorded a double-double of her own with 22 points and 13 rebounds. The Chaps shot 51.4 percent from the field and 37.5 percent on 3s, hit 14-of-20 free throws and won the rebounding battle 48-45. Tucker, Franks, Chitsey and Robertson all made the all-tournament team alongside Drury's Daejah Bernard (5'7''-G-98). Roberston was named the Most Outstanding Player. And if you ask the tournament's top star if she ever doubted her Chaps would win, she's quick to say she didn't. Robertson, who with Bobbi Chitsey (6'1''-F) was a member of LCU's 2016 national championship team, wanted to win and win in a way that was an example to the players younger than her. She wanted to be the person for her teammates the veterans of the 2016 were for her. And not only did she do that, but when the clock ran out she was able to share that moment with her sister. The DII Women's Elite Eight has come and gone at Alumni Hall in Columbus, Ohio, and this was your spot for the bracket, streaming information, scores, and live updates and analysis from the opening tip to the final whistle. Sixty-four teams entered the DII women's basketball championship, eight made it to the Elite Eight, four the semifinals and two the championship game. Indiana (Pa.) started things off in the quarterfinals with a 73-60 win against Azusa Pacific that featured runs from both sides that showed the ending was never a foregone conclusion. Southwestern Oklahoma State earned a 71-61 win during a back-and-forth game against Saint Anselm. 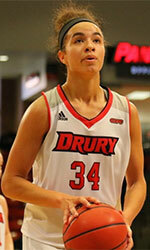 Drury coasted to the semifinals with a 91-60 win against Nova Southeastern. And Lubbock Christian beat North Georgia by 45, 99-54, to advance. During the semifinals, No. 2 Southwestern Oklahoma State pulled off a 66-57 win against No. 3 Indiana (Pa.) and No. 5 Lubbock Christian upset No. 1 Drury, ending the Panthers' undefeated season, 69-60. Lubbock Christian then beat Southwestern Oklahoma State, 95-85, in a double-overtime national title game. The Holy Family University women's basketball team dropped a Central Atlantic Collegiate Conference (CACC) South Division contest to city rival Chestnut Hill College by the score of 71-60 on Tuesday night at Sorgenti Arena. Holy Family led the entire first half after jump-starting the game with back-to-back three-pointers by junior Elizabeth Radley (Hainesport, N.J./Bishop Eustace Prep) and sophomore Anjelai Hayes (Woodbury, N.J./Woodbury). The Tigers led by as many as nine points early on in the second quarter. A jumper by sophomore Ege-Ly Viirmaa (Tallinn, Estonia/Kadrioru Saksa Gymnasium) made the score 25-16 at the 7:56 mark of the second frame. Over the next two minutes of action neither team scored a basket until Chestnut Hill's Bri Hewlett knocked down a three-pointer to open a 10-2 run by the Griffins to close out the half. As a result the Tigers' lead was cut to 27-26 at halftime. In the third quarter the lead changed hands five times with the Griffins grabbing a five point advantage on two occasions. With :18 seconds left in the quarter Morgan Orlowski knocked down a three to give the Griffins a 47-42 lead. On the following Tigers' possession, freshman Megan O'Connell (Philadelphia, Pa./St. Huberts) responded with a three-pointer of her own to cut the lead down to two points entering the final frame. Chestnut Hill never relinquished the lead back to the Tigers in the final quarter as the Griffins pulled ahead late after Holy Family made the score 54-51 with less than four minutes to play in regulation. Chestut Hill outscored the Tigers, 17-10, the rest of the way to win by double-digits. Hayes recorded her second double-double of the season as she finished with 10 points and a game-high 11 rebounds to lead the Tigers. She also had two steals and one block on defense. Radley and freshman Molly Masciantonio (Morton, Pa./Archbishop Carroll) each scored a team-high 12 points. Radley added six rebounds to the night, while Masciantonio recorded five rebounds, six assists and two blocks.